I just found a few moments to read one of your recent newsletters – Do they owe me feedback after an interview?” The situation described reminded me of my own experience. I needed a job. 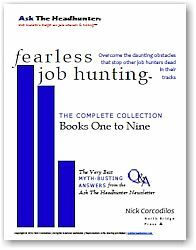 And it was before I knew about Ask the Headhunter – though, as you will see, it made be realize how smart you are when I finally did start reading your columns. Anyway, I was doing the shotgun thing – sending resumes here, there and everywhere, replying to want-ads, calling old co-workers, even people I didn’t really know. I interviewed one morning with a guy at a contracting firm (call him Mr. M.) who had a lot of people at a large manufacturing company in my city. I knew I wasn’t quite qualified, but I also knew I could learn what I needed to fairly quickly. But, this guy was having none of that. He proceeded to tell my how weak my resumé was and how extremely uninteresting I was to him. To put it mildly, he could have been a lot nicer. But, I had confidence in my worth. I just shrugged it off and kept looking. I found a short-term contracting gig, and eventually made it to Big Bank with a good, permanent job (where I still work). Some time later, a funny thing happened. We needed to hire a contractor. My boss handed me two resumés to see what I thought. And, wonder of wonders, one of them was Mr. M’s. (Remember him?) I rejected him immediately. He never knew that, of course, but it does illustrate what can happen. It’s a small world – and an even smaller town. Now, just so you know, I was honest with my boss. I told her that his qualifications were fine. I also told her the story of the interview. And she said that as important as technical qualifications are, she did not want anyone working for her who would treat people that way. A lesson for all of us. Yah, corny: What goes around, comes around. It’s a small world. We reap what we sow. You never know who you’ll run into again. Perhaps Mr. M., brusque though he was, had good reasons for not hiring this reader. But, it seems our reader had good reasons for not hiring Mr. M.
Always be nice to people. It’s a small town. I have talked with many executives who were treated rudely by recruiters or company HR folks while in job search mode. After they landed they were contacted by these same people trying to “get a contract” or get a job – their past performance did not help them at all. You reap what you sow! How would you like to be treated? Thanks! Family member (via marriage) ha a sales team he ran. Fired a team member and hadbthe gall to blow cigar smoke in the guys face as he do so. Flash forward a number of years. Same relative goes after a great job opportunity, goes through multiple interviews, looks like a shoe in for the dream job. Company flies him out to Texas for the final interview with the”big boss” and when he walks into the guys office, guess who it is? And on the flip-side, I had lunch with a coworker a number of years ago, and one of his buddies. We got along great, had a wonderful conversation about all kinds of things, both professional and personal. A few months later, I was interviewing for a job. Guess who the interviewer was? The friend of my old coworker’s. Needless to say, we didn’t have to finish the interview before I got the offer. They don’t call it the “Golden Rule” for nothing. Great story! It’s the Golden Rule and Aesop’s fable about the lion and the mouse. Eveyone is significant and it is important to treat them that way. People beg me for the secret to developing professional relationships that will lead to new jobs. But there’s no secret. It’s simple, common sense: Be nice to people, wherever you encounter them. That’s how to grow your network. I hope the example above makes it plain. Thanks for sharing such a good story. And it costs nothing to be nice. Its true, as you sow shall you reap! This reminds me of a situation that I’ve personally been through. As a headhunter, I do a lot of business development, mostly with HR managers. During the past 20 years I’ve met with mostly nice people, but also with haughty HR Managers who seem to think that they are doing me a favour in meeting with me and don’t shy away from making me feel it. Eventually, some of these people are out looking for new jobs, and they get in touch with headhunters whose business cards they’ve kept. They’ve forgotten how they treated the headhunters that met them to do business development (obviously, they treated them the same way as they treated me), and as you say it’s a small town, I will never consider a candidate who has treated me without respect or consideration as I believe they will treat their employees the same way. What goes around definitely comes around. There’s another huge piece of this “what goes around, comes around” story. And that is–in order to be nice to someone—you have to ANSWER some one. I find outright rudeness to be rare. But I run into people who simply don’t answer all the time. It’s amazing how many people don’t get that a “Thanks” or a “Got your note” can SAVE time by completing the exchange. Am guessing that there is probobly an ATH column on this somewhere! I agree with your article. However, if memory serves you often refer to HR people as Morons, Pinheads and, in typically, less than nice ways. So are you mending your ways and respecting HR people or will continue to denigrate them? That said, there are lots of very good HR folks who do good work, and they let me know. Now and then a sharp HR person calls me on something, they’re right, and I learn something. So, yes, I may tick off the profession with some of my comments. 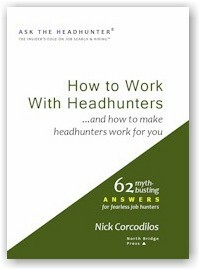 I also tick off headhunters sometimes. I believe it’s important to call a spade a spade when you’re in a position to influence the integrity of a thing. Do I make disparaging comments to individuals? No, because it serves no purpose. If an individual is doing something wrong, ineffective, or counter-productive, it’s good to try to influence them to change. So I try to do that. If that’s useless, all you can do is fire the person if they work for you, or stop doing business with them. I’ve had to do both on occasion. You learn to take responsibility for that, because it’s a big choice to make. But do I get rude with individuals? No, I don’t believe in that because it’s pointless. When I make generalized derogatory remarks about something, I’m ready to take the consequences because I believe I can back up my statements. Marcus Aurelius said, “Look a thing in a face, and know it for what it is.” Sometimes you have to call it, too. I keep tabs on my credibility, though. 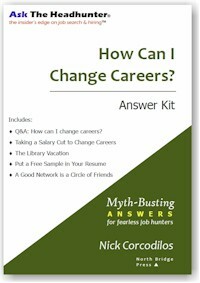 I’ve done keynotes for career counseling associations, and for professional resume writers. 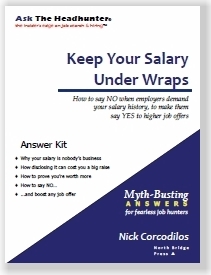 I’ve been hired by HR execs to teach their departments how to recruit more effectively. They all want to hear my critique, my advice, my suggestions, and my ideas. I try to hold up the mirror so they can see themselves, and I try to do it fairly. Inevitably, I learn a lot from them, too, because they hold up the mirror for me. Sometimes it tempers my opinions – and my words. You’ve gotta mix it up if you want to grow and change, and get smarter. I do that all I can, but I confess I’ve got a ways to go ;-). Sometimes I offer an apology because I’m wrong. But I try to fess up, move on, get smarter. This reminded me of a specific instance where I’d been VERY rudely treated by a networking contact. I’ve gotten used to the “I don’t know of any jobs” replies, and like replies. This guy was a real prick in telling me off, and essentially blaming me for my own predicament in no uncertain terms without any sympathy whatsoever. Last I’d heard he was still looking. I feel sorry for his family, but he needed to learn a lesson. However, did the reader have “good reason” to reject this person? Isn’t the real question: Was he the best person for the job? I am not sure that we have the answer to that question. do we know that this was not an isolated occasion of brash behaviour? His wife left him? Hi favourite uncle died? The dog ate his lunch? I wish to be able to say that I am glossy-and-sharp, always. put that best foot forward. or off-days because, at least in my case, I need them. Thanks again for a great newsletter!!! I totally agree with the person who brought up the point about everyone having off days. I have them too and I honestly don’t feel good during those days. But I just try to proceed with my life, as opposed to thinking constantly about those off days. Nobody’s perfect except for God or whatever deity one chooses. The nonprofit organization at which I am currently working is disability-related and embraces the idea that all people–including those with disabilities–are different and unique in some way. That was also true of the first nonprofit at which I worked. Everyone has gifts to offer, be it large or small. Regarding not responding to someone, I think this is indeed very rude and it has happened to me before. I can understand it if a person’s phone or email hasn’t been working, for example, and they plainly tell you that. But when somebody flat out ignores repeated attempts at contacting them, I think this clearly shows a blatant disrespect for whomever is trying to contact them. I can remember back when I had my very first VR counselor. There was no voicemail or answering machine at the office. What’s more, this counselor as well as subsequent counselors I had made a habit out of not returning phone calls, or at least not returning them in a timely fashion. Does it seem like I’m treading all over VR in these posts? If so you’d be absolutely correct. I believe what this country’s VR system needs is a major overhaul. But I don’t want to open up Pandora’s box because that’s not necessarily what these forums are all about. BTW, I have to agree on having off days. I went on an interview on Friday and I have forgotten to send a Thank you note to the person. Talk about a DOH! moment. Great discussion on this thread! What I find most interesting is the two points of view: (1) not hiring someone because they demonstrate an “attitude” and “aren’t nice”, and, (2) focusing on ability versus attitude. Does it matter if someone can do the job when they aren’t nice? Does “doing the job” require “being nice”? And, if someone isn’t nice because they have an off day, how do you compensate for that? Whose responsibility is it? I couldn’t disagree more. We always ask for feedback and honesty. How can we complain when we get it? didn’t have the specific experience he was looking for. That was great for me. His comment was to vague so I immediately started to probe him for more detail. I didn’t agree with his assessment so I was able to recover and secured a second interview. I’ll take cold honesty any day. Great article! I once had a boss who was very close to the top of a billion dollar retail company. So he was regularly showered with adulation from peers and underlings. Yet he was uniquely focused on speaking with and listening to the folks at the very bottom rung of this company’s ladder. He regularly reminded me that, “It’s nice to be important, but way more important to be nice.” He had learned it from his Mother — a very wise woman! I want to clarify … on my comment. Whether the person gets the job and whether the resume goes straight in the trash are two different things, in my view. The hiring manager should have a chance to see the resume (without the subjective input from the person who has seen the negative behaviour). It could be a personality conflict or anything … I do not intend to “make excuses” for anyone. However, I do want to avoid being dismissive, short-sighted or taking a quick 2D decision. My concern is to have the best qualified candidates available through the first round. On the second pass, the “soft skills” come into play more, for me. Really, I can swing the ax, if needed. I want candidates to have a fair chance … this leads into the whole video questionnaire concept, too. Text does not tell the same story as the voice and mannerisms. “Being nice” can matter on doing the job and not being nice if the person is being put in a position of authority where the person may have to do not nice things like firing people or reprimanding them. While not a deal breaker, it can be a big factor for whether or not some get hired, IMO. I had a couple of interviews where in both cases I rattled off a bunch of weaknesses of mine and what kind of work environment seemed to work better for me and what shortcomings I had had at other places to try to communicate where I would excel in helping the business get things done. One company said that “I would be hard to manage” while the other offered me the current job I’m doing where I’m doing good after 7 months on the job. I wonder if someone is upfront about having an off day, e.g. their car just stopped working, or their grandmother died, if that wouldn’t go a long way to helping compensate for that. We are all human after all and someone that looks too good may get rejected for a position because something seems fishy, e.g. the person gave textbook answers to the questions about the job and has the necessary qualifications but doesn’t quite seem like a human being. Hi Anita. 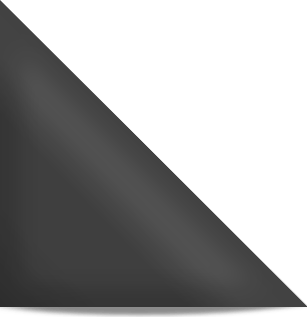 VR in this case stands for vocational rehabilitation. Based on my understanding, this is a program which aids in the provision of services such as adaptive technology, orientation&mobility training, and a few other services which help job seekers. However, different states have different criteria for becoming a recipient of these services and the process is at times rather bureaucratic. But in most cases though it makes for a very successful transition into the world of work for people with disabilities.